Wicanders Dekwall in Bali - a room view of a little girl lying on the floor of her natural colored bedroom with cork wall paneling. Wicanders Dekwall Cork Wall Covering in Bali, a light natural cork. Wicanders Dekwall Cork Wall Covering in Stone Art Platinum, a medium taupe color of cork wall paneling. Dekwall is a cork wall paneling that features the Wicanders' cork double layer technology which assures you all the benefits that distinguish the Wicanders' products such as comfort, noise reduction, and energy cost savings. Wall paneling created for those who want sustainability AND natural beauty, Dekwall cork walls add warmth and style to any room. Cork is also a natural sound absorber, reducing noise between and within rooms, creating a quieter, cozy environment. 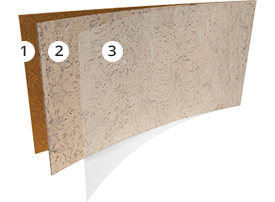 Corktech uses an engineered multilayer structure which consists of a quality core layer of cork and a genuine cork veneer. 2. On top of the thicker core is a thin sheet of cork, a decorative veneer that's created by combining unique textures and shapes of natural cork. Cork acts as a noise buffer between the wall and the rooms on the other side because of its acoustically insulating properties. It reduces noise between and within rooms. This is especially beneficial in apartments or other areas more susceptible to outer sounds. Optimal room temperature throughout the year thanks to cork's ability to hold warmth. It's thermal insulating properties create a barrier between the cold wall and the comfortable temperature of your home. And BONUS...we've noticed the added benefit of energy cost savings because of it! Fascinating textures and natural shapes combined with all the comfort of cork makes Dekwall an exceptional interior wall decoration, creating unique spaces full of style and charm. It's a natural and eco-friendly product that's pleasant to the touch. Or "cushy" as we like to call it. Cork wall covering has a long life span thanks to its elasticity and compressibility, which allows it to "give" without damaging the structure. It literally springs back from hard impacts, preserving its unique look for many years to come. Cork is a very durable surface that resists cracking & dents and is airtight to gas and liquid, yet still breathable. Cork also has a natural memory that will bounce back from impacts, retaining its elasticity. Cork (or more accurately, bark) harvesting is an eco-friendly process that's done without cutting down or destroying a single tree. And there are strict time limits on the extraction period. During its long lifetime - upwards of 200 years - the tree is continually regenerating bark, which makes the cork forest industry an ideal example of renewable production. Cork is also a natural fire retardant thanks to its unique cell structure and waxy, fire-resistant substance called suberin. It gives a very low conductivity to heat. And it burns without a flame and does not emit toxic gases during combustion. Cork is a great option for allergy sufferers because it's naturally mold and mildew resistant due to the waxy substance inherant in cork. AND it's anti-microbial. Cork is a healthy alternative to dust and allergen-collecting carpets. Wicanders Cork Wall Covering is a cinch to maintain. Simply wipe the wall with a damp (not soaking wet) cloth. For deep cleaning, use a mild pH neutral cleaner. We like Cal Flor Eco Clean Floor Cleaner.